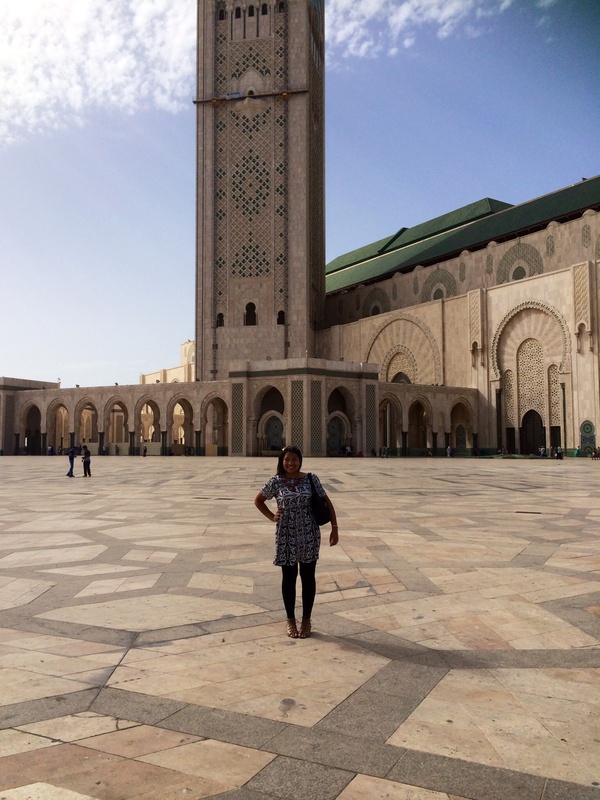 My first thoughts of Casablanca! Today has been a crazy but wonderfully eye-opening day. 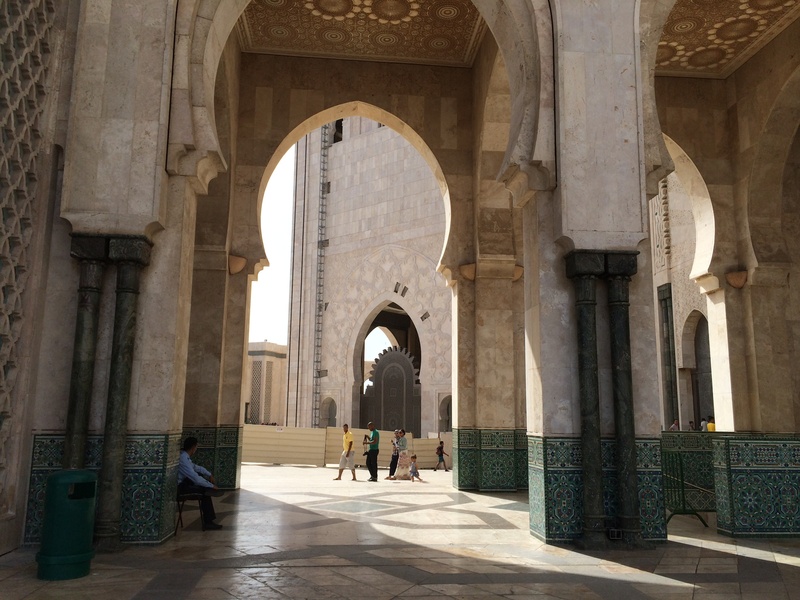 My flight to Casablanca from D.C was blissful. 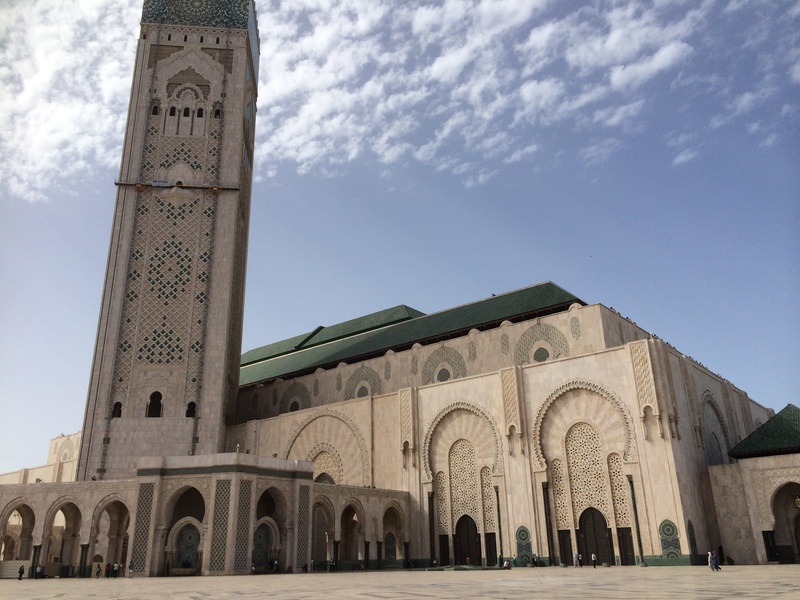 Discouraged by my flights to and from London with Kuwait Airways, which were both horribly late and caused me to miss connections, I prepared myself to have an equally as crappy time flying to Casablanca. But Air France surprised me by being perfectly on time, even arriving early to Paris so I had more time to get to my connecting flight from Paris to Morocco. The food was fabulous, the attendants were friendly and helpful and the in-flight entertainment was spot on. I watched Casablanca, of course, and American Hustle, along with a few episodes of Modern Family. it was so hard to choose what to watch though because I there were so many options! The only problem with the flight, which is no fault of Air France, was that I didn’t sleep at all during it; and when I arrived in Casablanca, it felt like 2:00 a.m. because that’s what time it was at home, but it was mid-morning in Casablanca, and I had whole day ahead of me! So, sleeping apparently wasn’t on the agenda. 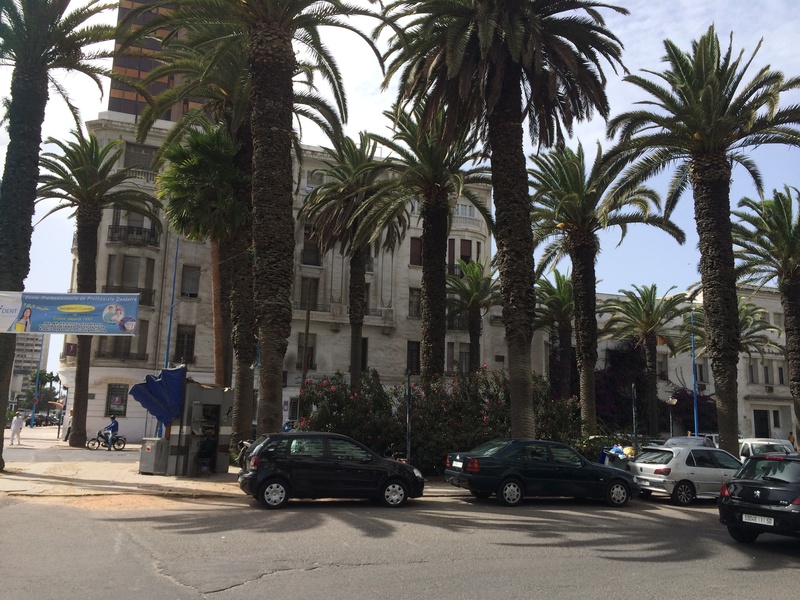 Consequently, I arrived in Casablanca rather delirious and not prepared for the adventure in store. My first dose of cultureshock came when I went to the bathroom at the airport. My word, the stench reeked to the high heavens, though the cleaning crew had been in there right before I walked in. As soon as I finished up and opened the door of the stall to walk out, another girl walked in the stall while I was still trying to exit. I was taken aback, but continued on my way. But I couldn’t reach the sink because the girl’s friend had opened up her suitcase right in front of the sink and was rummaging through looking for something to change into. I patiently waited for her to finish up, but when I saw her begin to strip naked and change into the new clothes, completely ignoring the fact that I was waiting to get to the sink, I gently reached over her suitcase and stretched my arms to the sink and washed my hands. As I walked out of the restroom, a bathroom attendant handed me toilet paper to dry my hands with, which of course left paper residue all over my freshly washed skin. Leaving the airport took some time, too, because I honestly could not tell which cars were taxis! None of the cars in the designated taxi area had the word “taxi” on them, but I watched as people got into them just the same. So I followed suit, but of course it was difficult to communicate with a driver who spoke only French and Arabic while I know only English and Spanish. I ended up showing him the address of my hotel which printed on tour documents, and he understood. Fourty minutes and 350 Durham later, I arrived at the Moroccan House Hotel. My heart started to race when I went to check in and the receptionist said she did not have my reservation. WHAT THE WHAT! I showed her my confirmation email and explained now I had booked through Expedia and had already paid, but she said they had no record of my reservation. So I sat down in the lobby while she contacted her supervisor to get my room worked out. Luckily, the interior of the hotel was so enchanting I was distracted from the room situation for a while. 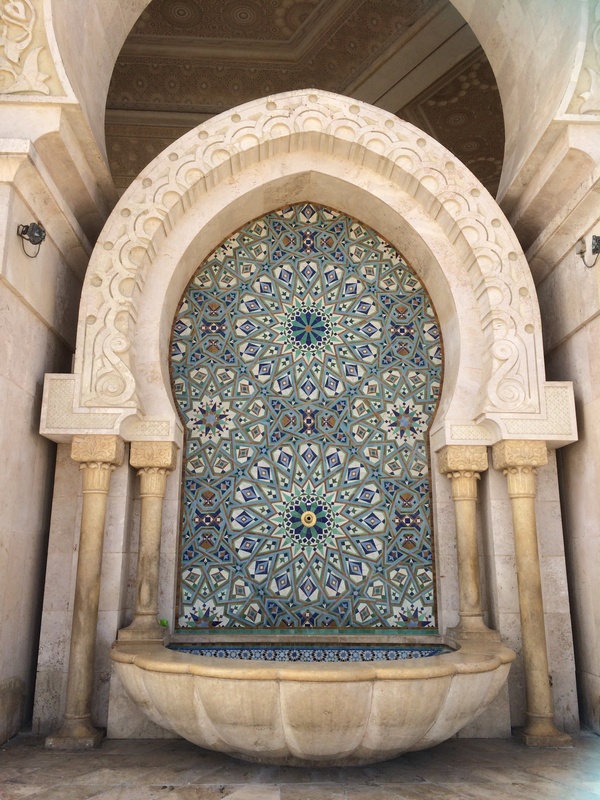 I looked around and gazed at the traditional Moroccan décor, including mosaic tiles covering every surface with elaborate designs and lavish furniture with beautiful, bright embroideries. A second receptionist brought me a tray of tea and cookies while I waited, which further distracted me from the situation, and I immediately set me at ease. I mean, c’mon, how can you feel anxious when you have a try of cookies in front of you? After a few minutes, I was told that they had an available room for me and a bellhop helped my bring my bags tog my room. Things were looking up! The hotel staff was very pleasant afterward and made me feel very welcome. I settled in, took a quick nap, then freshened up and got ready to head out into town and walk around. My first thoughts walking around were “Damn, it’s hot!” I wore a long, loose dress over a pair of leggings out of respect for the modest dress code. But even those clothes made me feel like I was burning up in the desert sun! 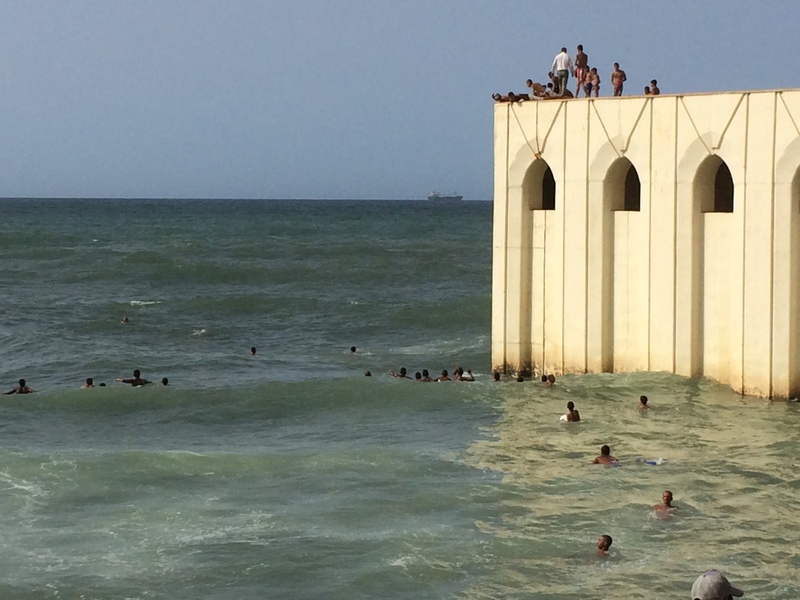 Despite the heat, Casablanca glistens. It’s the most metropolitan city in Morocco so not surprisingly there were people everywhere, including in the streets, as if traffic wasn’t anything to worry about. The city has a general foul odor to it, but as I walked closer to the ocean, the breeze helped whisk some of the stench away. I walked along a long, main road which ran along the coast of the shore. I couldn’t see the water though, because buildings and sand walls blocked the view. 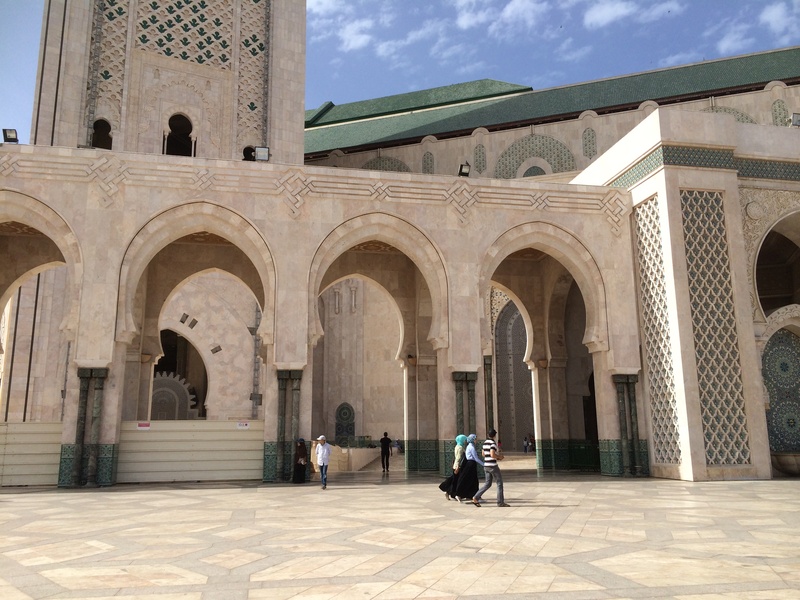 I continued on until I arrived at the Hasan II Mosque. 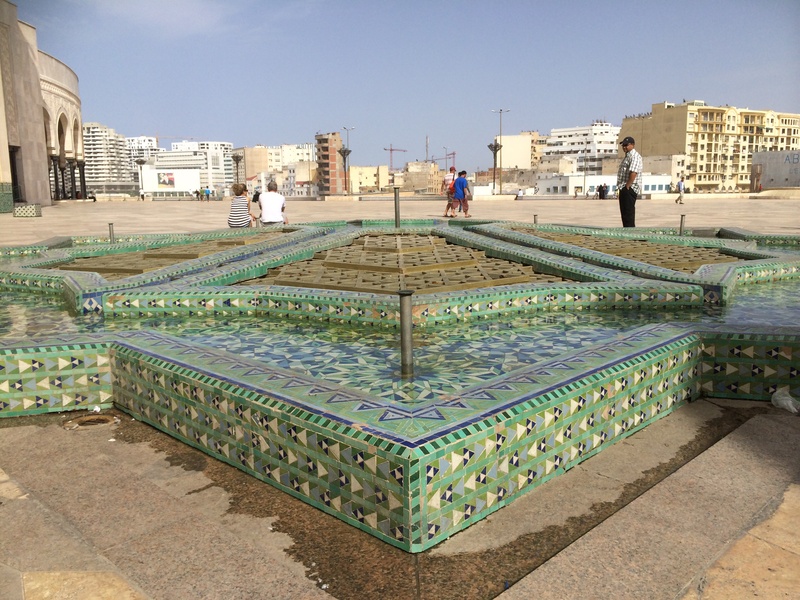 I don’t know much about its history, so please forgive me for my ignorance, but I did know that it was an extraordinary architectural feat and is the main attraction of Casablanca. It’s hard to describe how grandiose the structure is, so I’ll let the pictures do the talking. 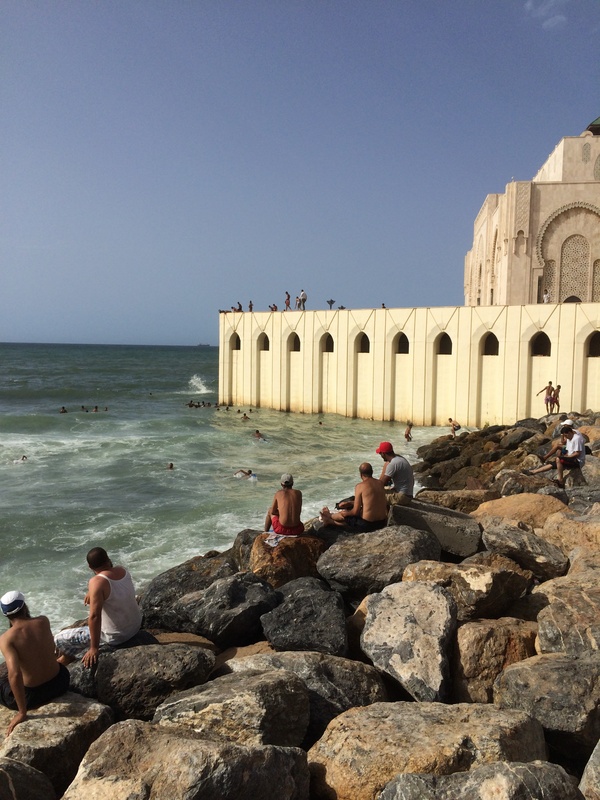 I spent about an hour at the mosque, taking pictures and soaking in the sun as I stood at the water’s edge to watch wave crash against the mosque’s foundation. 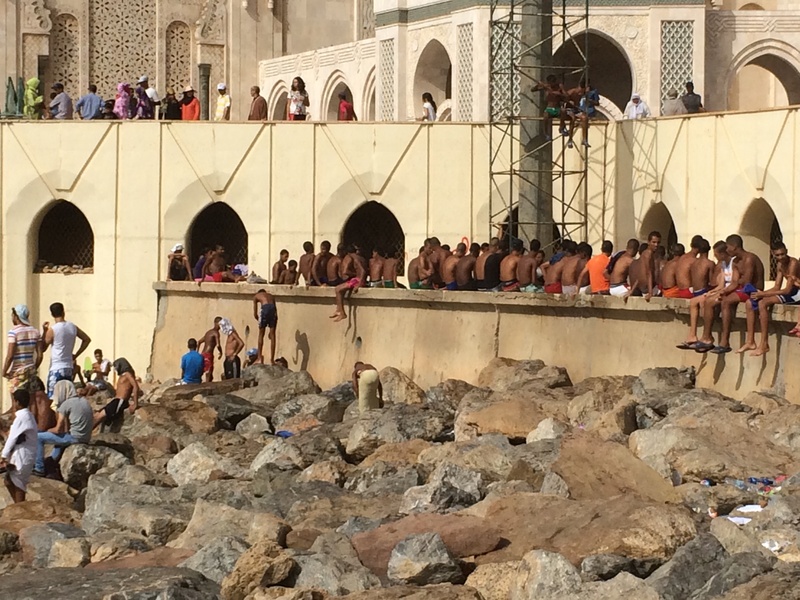 I was surprised by the number of people swimming in the water; there was no beach, so people (as in young men and boys only) were eagerly jumping over huge rocks to dive into the crashing waves. I was surprised no one got hurt, but I figure they do this so often they know how to protect themselves. 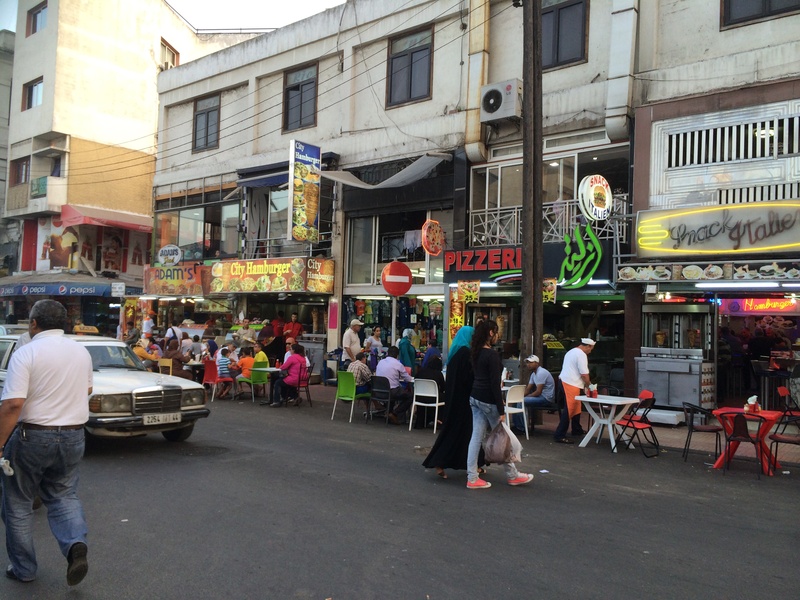 After leaving the mosque, I wandered the streets for a while. I was starving, but I couldn’t find a restaurant that looked inviting. I have this thing about always eating outside at restaurants when it’s warm out, and luckily almost all restaurants here have outdoor seating, but very few had seats that weren’t full of men watching me as I walked by and making cat calls. I knew they were probably harmless, but I didn’t much fancy the idea of sitting down alone next to a table of me watching me while I ate. So I continued to walk around for about two more hours, looking for a place to eat. 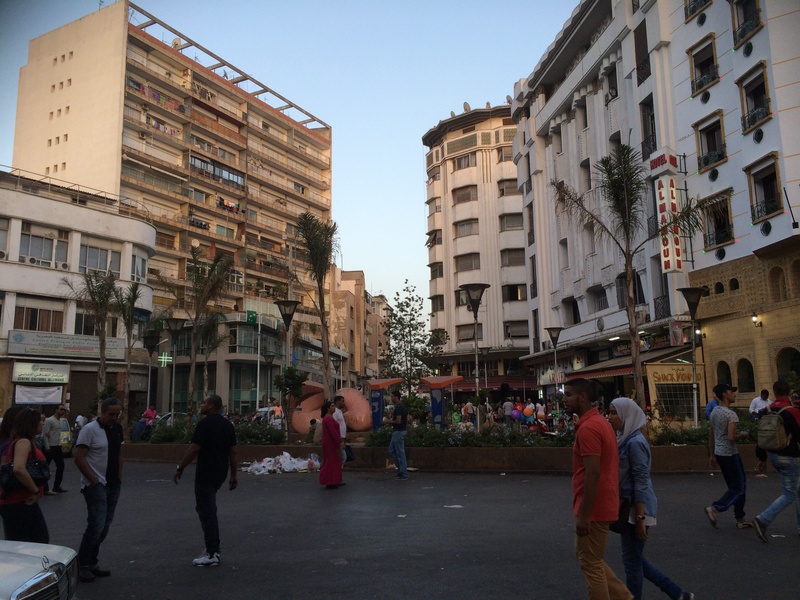 Along the way, I got to see more of the busy streets and North African architecture. 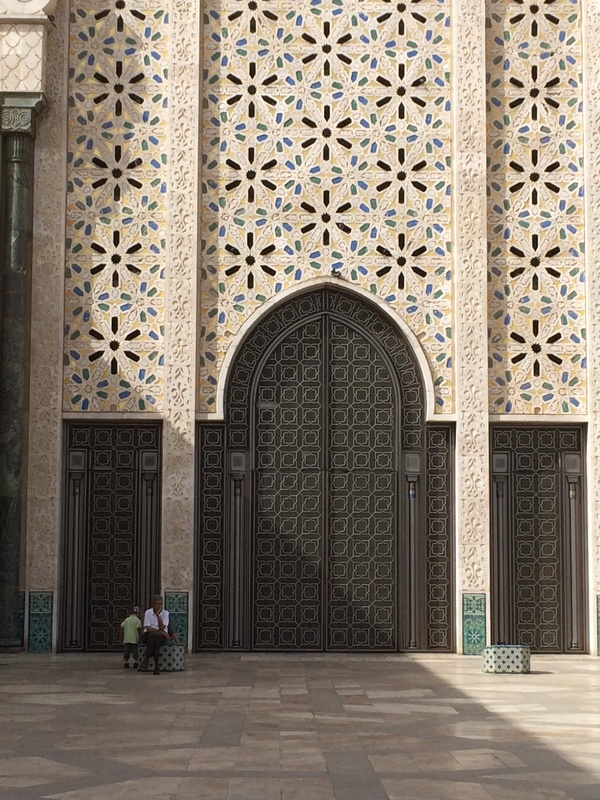 Casablanca is unlike any city I’ve ever visited. The buildings have modern, geometric designs, but most are run down and decrepit. Sand plays a huge role in the colors of building and walls here, as most are shades of tan and white. I enjoyed wandering around and taking pictures, but hunger got the best of me, and I ended up at McDonalds. It’s the last place I ever want to eat when I’m traveling because I’d rather enjoy authentic local food, but I needed someplace reliable and fast, and where I knew how to pronounce the items on the menu. So, McDonalds it was. I ate quickly and resumed my place wandering the streets. This time, I found myself in a bustling area, apparently the city center, which was full of shops, cafés and street vendors trying to bargain with every person who walked by. 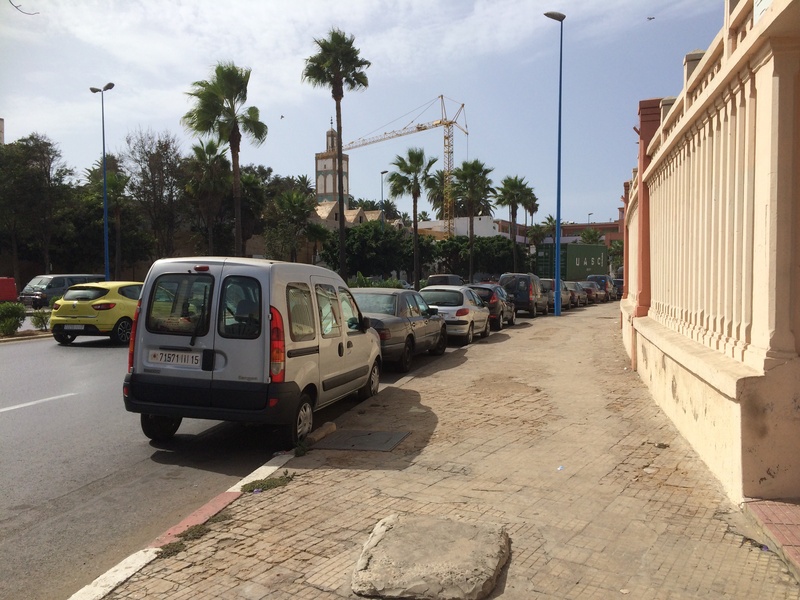 I walked a few laps around the streets, just soaking in the views and observing how Moroccans behave and interact. They’re much less bothered by personal space here, a lot more honk-happy when it comes to driving, and everyone seems to know everyone. I was learning a lot, but by then the sky was getting dark and I decided it was in my best interest to head back to the hotel. I’m now in my hotel room, writing this post on my iPhone (so please excuse any typos!) and getting ready for bed. It’s been a long but exciting day, and I can’t wait to connect with my G Adventure tour group tomorrow. I like Casablanca, and it’s been a joy to explore alone, but I think having some traveling companions and a tour guide to help give context to everything I’m seeing will make the rest of this adventure even better. 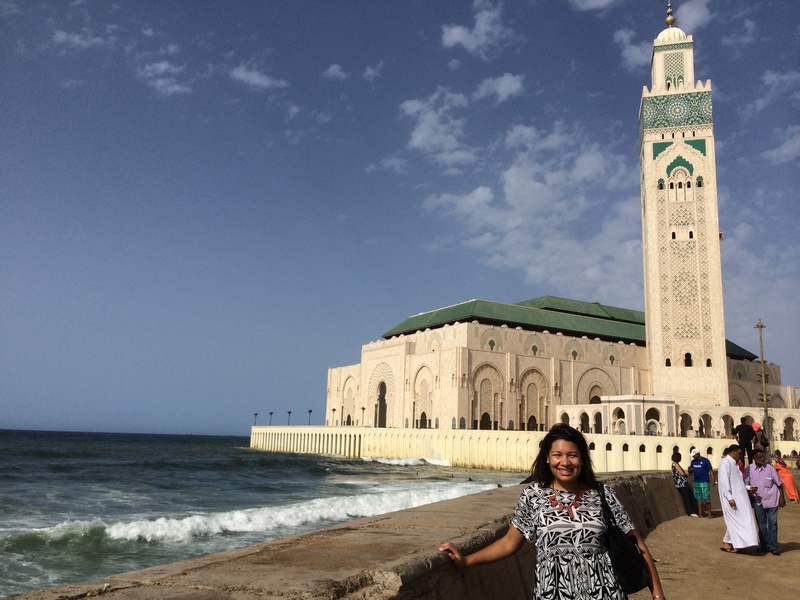 Previous Post I won a trip to Morocco — and I’m leaving in 2 days! Nice post. 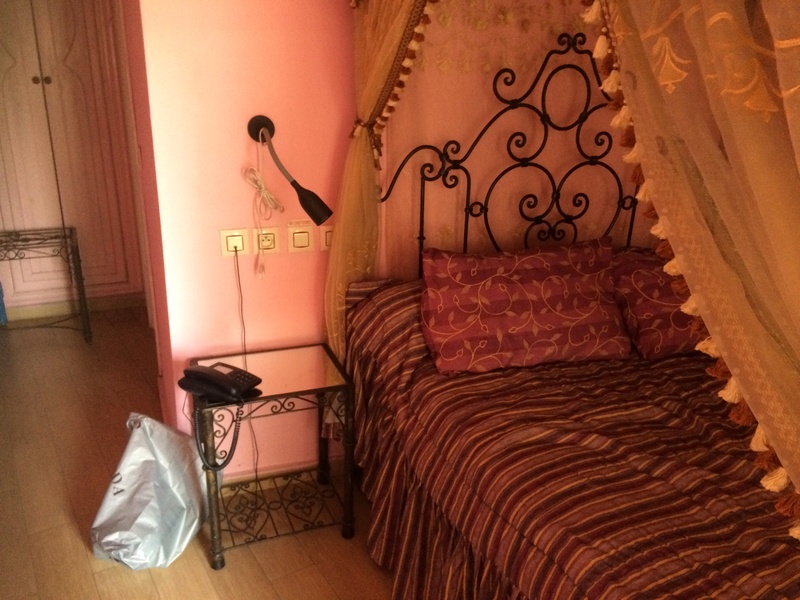 Seems like you had an enchanting time in Casablanca. I have never been there and but this first thing I thought was that you are alone, fun, but not great. I always try to travel with someone. Feels a lot better that way. Hope you had a great time on the resy of your trip. Thanks! Yes it is enchanting here. I’m only alone for about a day and a half, then I’m joining a group, so it won’t be too bad! Yeah, I tried to get friends to come with, but no one was able to. It’s okay though, because I’m learning a lot. Thanks for the advice! Hope you also have great travels! I understand now. Do take care and I like your optimism. Nice post. 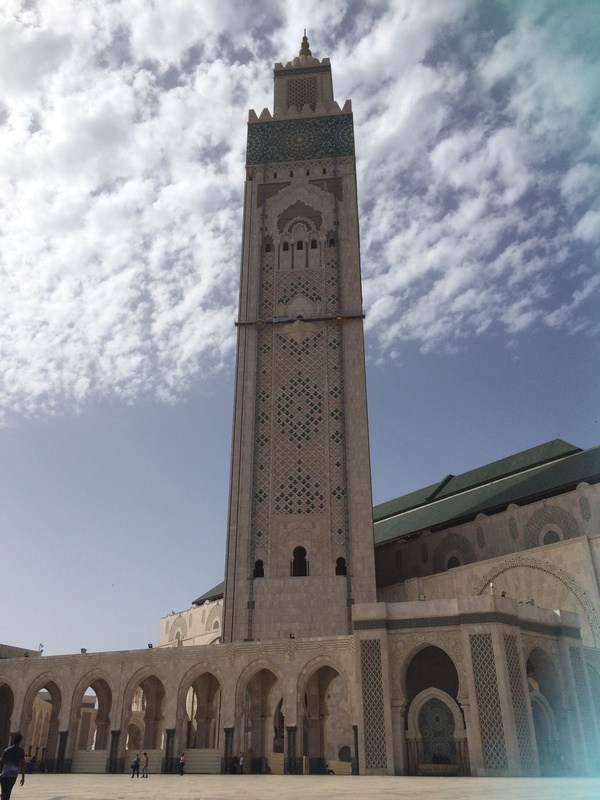 Seems like you had an enchanting time in Casablanca. I have never been there and but this first thing I thought was that you are alone, fun, but not great. I always try to travel with someone. Feels a lot better that way. Hope you had a great time on the rest of your trip. No idea what time it is there now, but I hope you’re having wonderful time so far! Glad things worked out with your hotel. Enjoy adventuring around with your group! Thanks Jenny!!! We’re about six hours ahead here. I’m having a great time here, but also can’t wait to come home and tell y’all all about it! See you soon and enjoy the first week of class!